I hope everyone enjoyed the summer as much as Sister Marge and I did. We had a great time in Florida. It’s wonderful to meet once a year with my family. Upon our return we had a quick breather before we were off to the Northeast Lecturer’s Conference. This is a good time to meet friends from the other six states in our region. The National Lecturer, Judy Sherrod, and the National Leadership/Membership director, Rusty Hunt, were there also. They are usual attendees at our conferences now and they marvel at the co-operation of states in our region and the success of our conferences. They are enjoyable and full of useful information for Lecturers. Our State Lecturer, Sister Marge Bernhardt, compiled a great program that I thought was the best of the seven. I’m glad there were so many there from Connecticut to take part in it. She works hard all year long for our Grange. Now that the fun of summer is drawing to a close the time for work is upon us. This month many Granges will be installing officers. This is a good time to introduce your friends or family to the Grange, if your installation is an open meeting. That’s what got me to join the Grange. I attended the installation of Sister Marge as Lecturer of Danbury Grange. I was so impressed with the ceremony that I joined that night. So let’s use this to impress other potential members. September 18th to October 4th is the Eastern States Exposition.” The Big E”. The New England Grange Building will need volunteers to help staff it for those seventeen days. If you can occupy the Connecticut Room a day or two during this time, please contact Doris Shaw at (860) 956-5237 and she will fit you in. If you can help out in the country store, please contact Betty Jane Gardiner at (860) 658-2855 and she will gladly use your help. She would especially need help in the evening from 5:00 till 9:00 p.m. 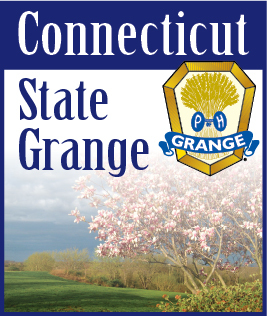 If you can come on Grange Day and march in the parade with the Grangers from New England, just contact me at (203) 744-1656. Tickets and parking passes will be supplied for all volunteers. Last but not least is our approaching State Session. Much preparation is needed. There are many reports that have a due date that need to be filled out. They are all in the Blue Book. A list of the contests and their requirements can also be found here. Please look this information over and take part in as many as possible. Most importantly are resolutions from the Community Granges. What do our communities need? What is needed to improve our Order? Remember the Grange is a grass roots organization. It derives its priorities and policies from the bottom up. We the members of the Community Granges determine the fate of our Order. So let’s get to work and make our State Session a successful one. There will be some information about the State Session in this issue.